Customized Outrider Polarized Panama Sunglasses are outstanding promotional gifts for any event in the summer season. 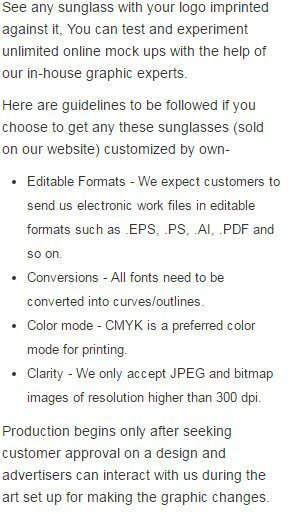 These custom designer sunglasses can be used for the promotions or beach resorts, amusement parks and also travel related brands or organizations. Made using polycarbonate material, these custom new arrival sunglasses also has polarized, shield mirrored lenses and also UV400 protection. Order these products with 1" W x ?" H imprint space right now to earn free online proofs, free design and no payment required until design approved offers. Request a quote to know savings that you can pocket on bulk ordering these Customized Outrider Polarized Panama Sunglasses.